There is nothing like a walk on the beach or a bike ride through the woods to quiet the mind and refresh the soul. One of the top reasons that visitors and summer residents return year after year to Northern Michigan is the abundance of outdoor activities. Sure, you can partake of outdoors in the big city. Tennis, golf, running, and in places like Chicago, even sailing and boating. But the big city just isn't Northern Michigan. Here there is no smog, no noise, no crowds. A bike ride north of Harbor Springs might find an encounter with a deer not a city bus. A run along the Petoskey waterfront can be met with a glistening sunrise over blue water not over high rises. No high rises are here. No crowds. No traffic. No worries. 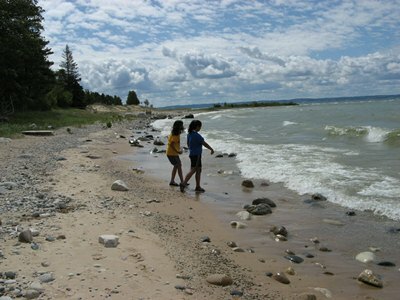 Outdoor activities are a huge part of why many people visit Northern Michigan. Our visitors and summer residents often bring back with them memories of vacations past and create new memories filled with beach days, picnics, hikes, walks, run, boat rides, and golf after dinner. Aahh, the great outdoors. In Northern Michigan, we are blessed with long summer days. Because we are on the western edge of the Eastern time zone, sunset in July nears 10 p.m. A round of golf after dinner? Yes! Or go for a kayak, water ski, fish, take a long bike ride or toss the disk in disk golf. All after dinner in the summer months. Summer is not the only season to be outdoors. Winter here is spectacular. Three of the country's best downhill ski resorts--Nub's Nob, Boyne Highlands and Boyne Mountain are here. Cross country skiing and shoeshoeing, snowmobiling, ice fishing, back country skiing, ice skating and sledding fill each and every winter day. Spring brings out the golf clubs, the bikes, and the fishing gear. Play a round of disk golf and then go morel mushroom hunting. Or bike along the North County Trail and then walk on the beach and watch the sunset. The fabulous colors of fall make a round of golf or sail on Little Traverse Bay a must. Northern Michigan is not a place where people sit indoors. There is just too much to do and too many ways to spend the day in the Great Outdoors! Fall Color Activities: Fall Foliage in Northern Michigan on M-119 is spectacular!